In today’s competitive web world, keeping your users engaged with your web solution can be a challenging job. Nowadays, people prefer viewing content that is not only unique but also interactive. So, if you want to communicate your message to clients in an interactive manner and seeking ways to attract good traffic to your site, then animation is an investment worth making. Animations when used wisely can help in improving your users’ online experiences. Today, you can find several websites that make use of animated and toggle effects to make a design persuasive enough to drive traffic. Basically, many designers and developers today use animated elements with effects like slide, drop-down, etc. to make their design visually more appealing. Fig1. Navigation with Open/Close toggle effects. In this post, I will show you an example of toggling the OPEN/CLOSE states of a menu using only CSS. As users are becoming more accustomed to using mobile devices than desktop computers for browsing the web, having a website that is not optimized for mobile use can make you lose many potential customers. This is why mobile-optimized design have become an important part of almost any web development project. When creating a mobile website design, focus on creating content for small screen displays. For instance, the main navigation menu must be short, of course, and you can’t display all the navigation items as you would on a desktop version of your website. You can hide your navigation menu items and add an option to enable users to view the hidden menu items when needed. One great way to do so requires creating an off-canvas menu. Step1. Write HTML to lay down the foundation of your design. 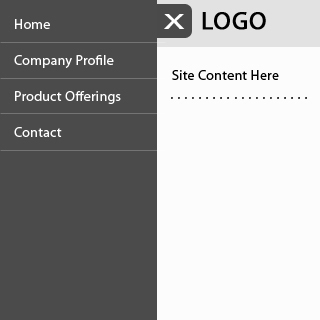 First, you will have to write HTML markup to create a menu toggle switch for your off-canvas menu. The above HTML markup comprises of three main elements: the main navigation menu, a check-box along with a label, and your website content. Step2. Use CSS to embed toggle effect in your navigation menu. 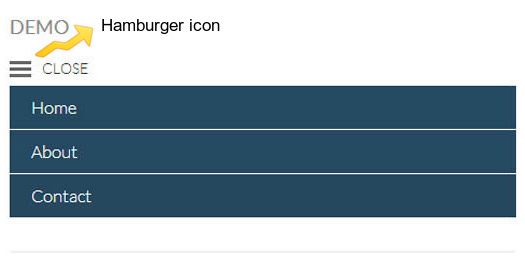 The First declaration block contains a CSS selector ".nav-trigger:checked + label". This selector provides control over the trigger position of your menu. Furthermore, "left: 210px" determines the position of the toggle when the menu is open. The Second declaration block has a "site-wrap" element that ascertains that the content of your website will be covering the complete menu. In addition, a box-shadow element is defined for improving the look and feel of the menu. The image below (Fig2.) is what the browser will render once you implemented Step1. and Step2. View the TOGGLE MENU DEMO at the end of this post. Use the "View Page Source" in your browser to view the full source code. Fig2. Browser’s Display of the Menu from adding the HTML and CSS code above. Full source code in the DEMO at the end of this post. Hopefully that the example included in this post will give a good idea as to how you can add the Menu toggle effects using only CSS. I discussed how you can add animated and toggle states in the navigation menu. But keep on experimenting to find what other toggle effects you can create with the help of CSS. View the TOGGLE MENU DEMO. NOTE: Use the "View Page Source" in your browser to view the full source code. Jack Calder is a magnificent web developer involved in the process of PSD to HTML and CSS conversion. The above article is being written with some sense to show the nice caliber of him.